In recent weeks, when President Donald Trump has made the argument that “walls work,” he has pointed to El Paso, Texas, as a border wall success story. Trump cited the West Texas city in his State of the Union speech last week, when he spent a large portion of the address reiterating his administration’s talking points around immigration. A barrier was built in El Paso nearly 10 years ago, and the introduction of that barrier, Trump said, allowed El Paso to undergo a profound transformation from a dangerous border city. 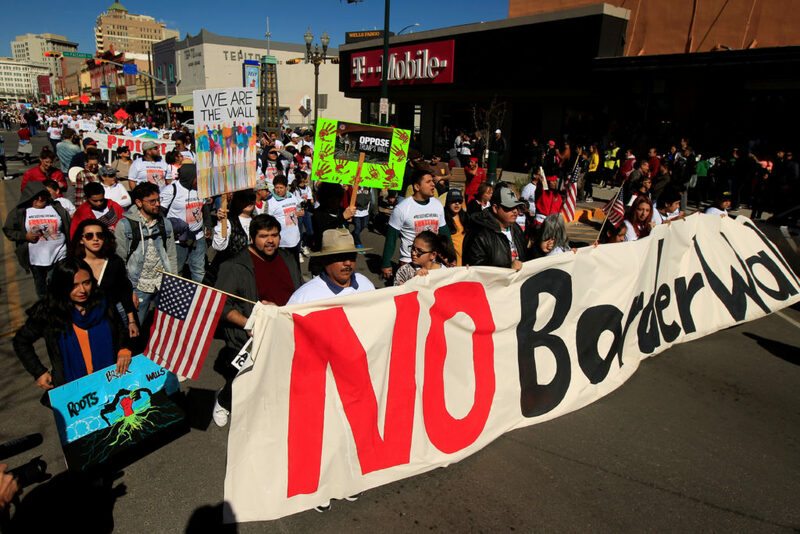 Monday night, opponents are holding an anti-wall march in El Paso will to coincide with Trump’s visit. The rally is being led by former Democratic congressman Beto O’Rourke, who represented the area until stepping down from Congress earlier this year and is reportedly weighing a 2020 White House bid. Trump’s comments about El Paso have already prompted multiple fact checks on his claims. The consensus? He’s incorrect. The 57 miles of border fencing in El Paso was constructed a few years after Bush signed the Border Fence Act in 2006. In January, Republican Texas Attorney General Ken Paxton told Trump during a border security roundtable that the border wall worked in El Paso. As proof, he cited the noticeable drop in crime after the barrier was built. “We’ve tested it in Texas,” he told the president. But as the El Paso Times pointed out, the crime data has not backed this up. According to available FBI crime statistics from the agency’s Uniform Crime Reports, the rate of violent crime in the city spiked in 1993. More than 6,500 violent crimes were recorded that year, the newspaper reported. But violent crimes declined in the years since that spike and before construction of the border fence took place. In their resolution Monday, El Paso County officials noted the city’s violent crime rate dropped 62 percent between its peak in the 1990s to 2007, a year before construction on the fence began. The crime rate in El Paso also rose from 2006 to 2011. Construction of the wall in El Paso finished in 2008. “We‘ve had a fence for 10 years and it has impacted illegal immigration and curbed criminal activity. It is NOT the sole deterrent. Law enforcement in our community continues to keep us safe,” Margo added.